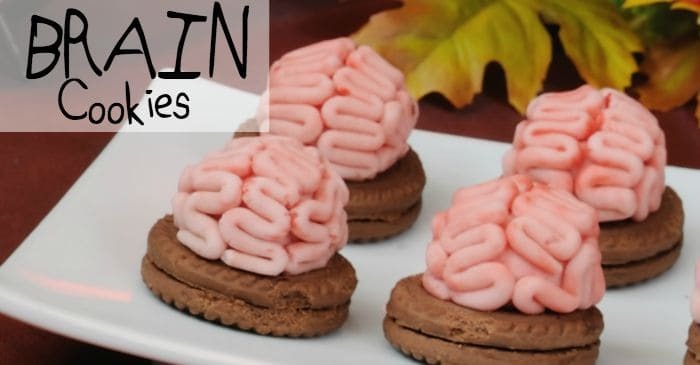 No, they’re not real brains. So, the zombies out there can stop drooling and the normal “alive” people can start salivating. 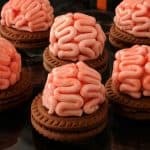 Quickly-made before a kid’s halloween party, these Zombie Brain Cookies also double as snacks in the event of a zombie apocalypse. Technically, these are vegan, since they’re egg-free and dairy-free, so you can take them to the kid’s school party, feeling sure that there’s no issue serving these to kiddos who might have a mild egg or milk allergy. (Did you know Oreos are vegan–except for some minor milk cross-contamination?!). Hold-up, I think I see some creepers coming for a batch of these–oh, wait, it’s just my kids. One box of your favorite cream-filled cookies. Technically, Oreos don’t have any milk or egg in them, so you can go with those, but all I had on hand was off-brand. Whatever. You choose–whatever your needs are. Just pick a darn cookie or even make your own. Honestly, this is the least important part of this recipe. It could be on a cracker and kids would still love it. LOL! Cream the coconut oil and sugars together. Add vanilla, milk and salt and mix thoroughly. Mix-in the oat flour in small increments until mixture is smooth. Stir-in chocolate chips, if that’s how you’re going to roll. Using a melon baller, make scoops with a flat bottom. Place scoops onto a cookie sheet covered in wax paper (this is for easy clean-up, not for any real purpose). Make as many scoops as you are going to make cookies. My recipe will make about 15, maybe more, maybe less, depending on the size of your melon baller. Place in the refrigerator for about 10 minutes to allow the shape to “set”. Open your can of coconut milk and scoop the thick cream part into a bowl, trying to get as little of the coconut water as possible. Discard coconut water or just set aside for chugging later, whatever. Fold-in the pink and red food coloring. Don’t worry about mixing it in too much, just get it pinky-red and call it. Its ok if it’s kind of streaky–it’ll look cool that way. Place bowl in fridge until you’re ready to use it. Lay your cookies out on a cookie sheet. You’re not baking them, so you can place them close together, this is just for ease of grabbing/placing. Take your cookie dough balls and place each one on a cookie. Mush them down onto the cookie just slightly so as to make the two stick together. 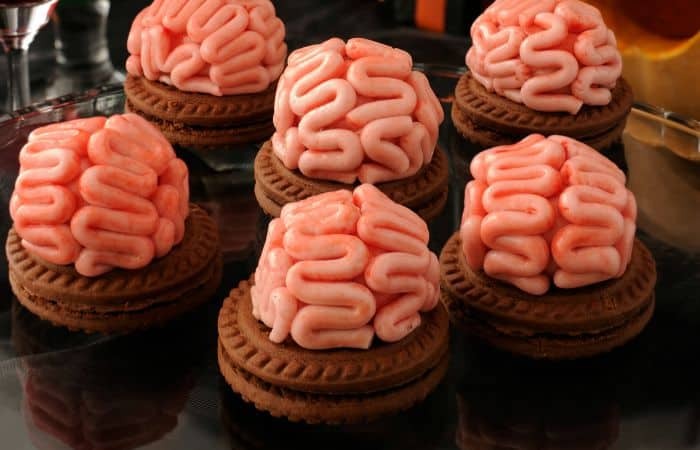 It’s ok if this makes the cookie dough less round–brains aren’t perfectly round after all. Take your icing and put it in a pastry bag with a tiny round piping tip. I used the very smallest I had, which was like teeny-tiny looking, but turned-out to look giant on the cookies, so it worked out. Feel free to do the same experimentation in your kitchen. Next, I recommend you pick-up a cookie and, with your dominant hand, slowly pipe 4 rows of squiggles on each cookie dough ball, making sure to keep the squiggles tight and equally spaced. BUT, if you make a mistake, just pipe a little more and fix it–or scrape it off and start over. I had to experiment a little and I think I gave-up 3 times (and ate the cookie) before finding my groove. Now, this is the hardest part: Put these cookies on a nice plate and RUN because here come the zombies to eat them! 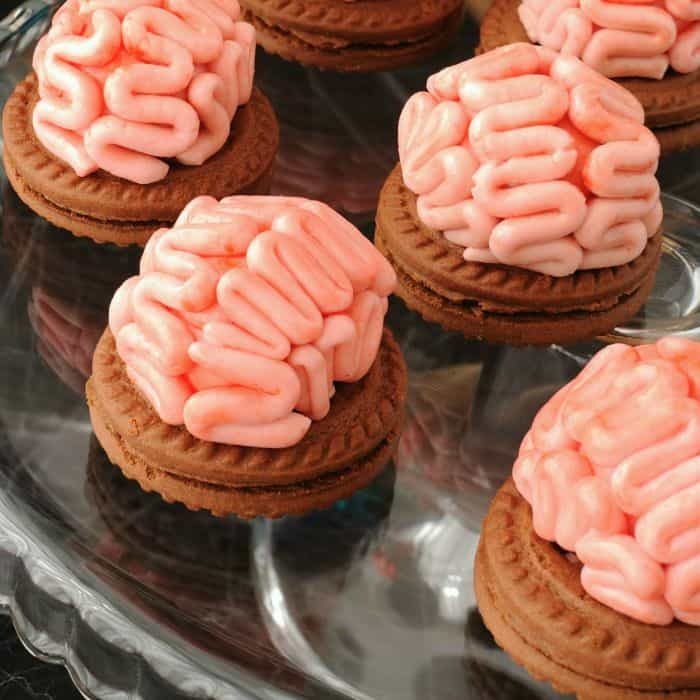 Gimme a break, you know you want to make these crazy brain cookies. Not only will the kids love 'em, you will too. And, the best part is: when the zombie apocalypse comes, you'll totally have snacks to pass out. LOL! One box of your favorite cream-filled cookies. Technically Oreos don't have any milk or egg in them, so you can go with those, but all I had on hand was off-brand. Whatever. You choose--whatever your needs are. Just pick a darn cookie or even make your own. Honestly, this is the least important part of this recipe. It could be on a cracker and kids would still love it. LOL!